Shortly after being born, Afeni renamed her son Tupac Amaru Shakur, after an ancient Inca revolutionary. Below is a brief biography of the largest indigenous leader in the Americas during the period of European colonization. Copyright 2007, Marc Becker – “Encyclopedia of Activism and Social Justice”. 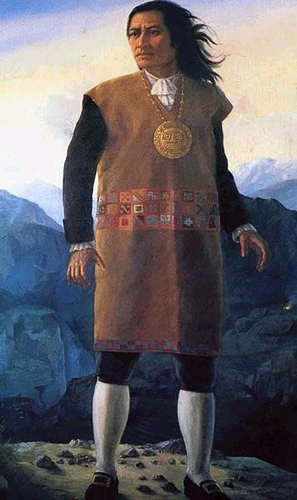 Born José Gabriel Condorcanqui in 1738 outside of Cuzco, the former capital city of the Inca Empire, Túpac Amaru II traced his lineage to Túpac Amaru, the last Inca emperor, who was executed by Spanish Viceroy Francisco de Toledo in 1572. His father was a curaca (chief) over the region of Tinta (Cana y Canchis) southeast of Cuzco and operated a successful trade route. The young Condorcanqui enjoyed the benefits of a Jesuit education, was fluent in both the colonial Spanish and indigenous Quechua languages, and could operate quite well in both worlds. On his father’s death in 1750, José Gabriel inherited his mule train as well as his curaca status. He became a successful trader, gaining power and prestige throughout the central Andean highlands. At the same time, he also engaged in repeated legal battles with the Spanish colonial authorities to retain his curaca status. He also witnessed Spanish abuses of the indigenous population and growing discontent with colonial rule. Economic reforms had improved the efficiency of tax collection, which increasingly alienated Creole and mestizo populations. Finally, on November 4, 1780, Condorcanqui took the name of Túpac Amaru and called for the expulsion of the Spanish and for the establishment of an independent Inca empire. On April 6, 1781, the Spanish captured the leadership and took them to Cuzco. On May 18, Túpac Amaru II watched the torture and execution of Bastidas and other family members before he was drawn and quartered and his limbs distributed throughout the area as a lesson to discourage other indigenous revolts. The name Túpac Amaru remains today as a potent symbol of resistance.